A man has been arrested on suspicion of murder after a woman was killed and five injured in a knife attack in Russell Square, central London. Police were called on Wednesday to reports of a man injuring people, including a woman in her 60s who died. A 19-year-old man was arrested at 22:39 after a Taser was discharged by an officer. The Met said mental health was a “significant factor” in events. London Mayor Sadiq Khan called for the public to remain “calm and vigilant”. Two other women and three men received various injuries in the attack, Scotland Yard said. Two from the group remain in hospital while the other three people have since been discharged, the force added. After receiving treatment in hospital the arrested man is now in police custody. The Met’s assistant commissioner for specialist operations, Mark Rowley, said the force’s homicide command was leading the investigation into the attack, with support from the counter-terrorism unit. Paul Ó Geibheannaigh, who lives near to the square, said he had seen the body of the woman “on the pavement” and the area was surrounded by a “heavy armed police presence”. “I haven’t seen a police presence like that in this area since 7/7,” he said, referring to the terror attacks on the London transport system in July 2005. He said the “guy kept screaming his guts out” and “police were screaming ‘stop, stop, stop'”. After the man was Tasered, he said, the man was on the ground “for at least 30/40 minutes” while police waited for an ambulance. Zuhair Awartani was trying to return to a hotel where he was staying when he saw a “dark-skinned man” in his “late 20s” being arrested. Mr Rowley added that Londoners would see an increased police presence on the streets, including armed officers, to “provide reassurance and safety”. BBC News home affairs correspondent June Kelly said police would be looking at the man’s background and his associates and whether he was known to them and health professionals. 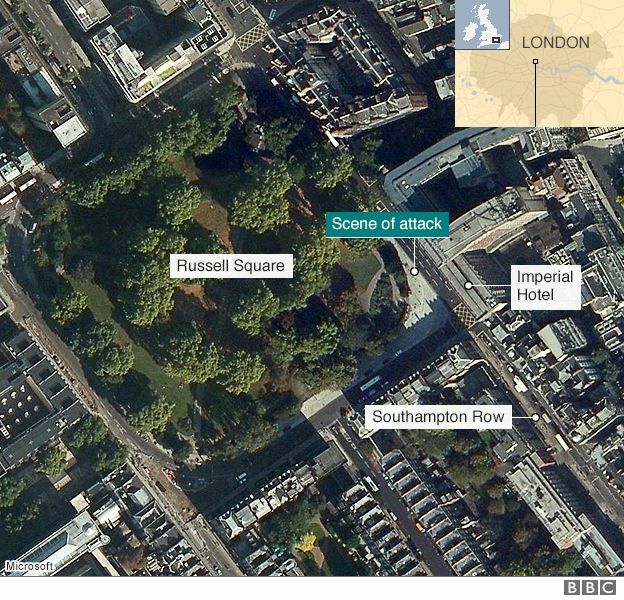 Mr Khan said his “heart goes out to the victims of the incident in Russell Square and their loved ones”. He said police were doing an “incredibly difficult job” and the safety of Londoners was his “number one priority”. The mayor added that police were “working extremely hard to investigate exactly what has happened and to keep the rest of us safe”. Walking around the park at Russell Square, it almost feels like just another weekday morning. A few dog walkers and commuters buying their first coffee of the day. The street is a busy area for tourists with two hotels, cafes and a few souvenir shops. But just a few metres away along Southampton Row, there is a different story taking place. Police tape cordons off a wide section of road, a white and yellow tent marking the point where one of the stabbings took place. As the tent blew in the breeze you could still see the blood-stained pavement before officers ran to pin it down. Police are guarding the street and there are rows of journalists gathered. Two small bunches of flowers have been left along the park railings. Shyam Sanghani, who runs Imperial News and Gifts opposite the scene of the attack, said: “We had more police announced yesterday and then this today, it’s scary. Kevin Hurley, former lead on counter terrorism at City of London Police, told BBC Radio 4’s Today programme: “First and foremost, the tragic event that occurred could have happened at any day of the week in any street in our cities, because there are lots of mentally disordered people who should be in hospital and who are out and about. This is not unusual. We should not jump to conclusions and say that this is terrorist-related. “However, it is another reminder of the fact that we need to do more, potentially, to stop people from being groomed on the internet and hate creatures spreading some unpleasantness. 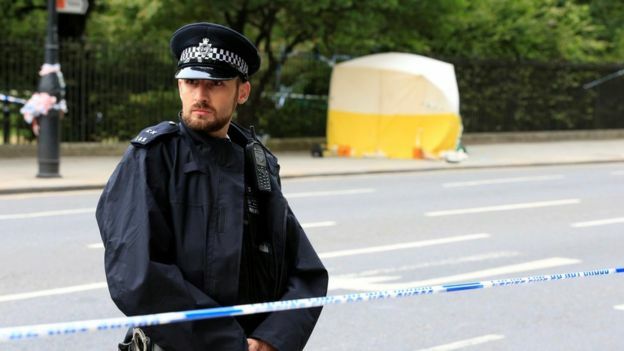 “But let’s remember, you’re much more likely to likely to die or be badly injured in your home, than you will either by a mentally disordered person, or indeed a terrorist.”A police forensics tent has been erected on Southampton Row, outside the park in the centre of the square, which is close to the British Museum. The woman killed in the attack had been treated at the scene but was pronounced dead a short time later. Earlier on Wednesday, Metropolitan Police commissioner Sir Bernard Hogan-Howe and London Mayor Sadiq Khan had said that there would be more armed police seen on patrol in London. Sir Bernard announced the move to reassure the public and deter attackers following terror attacks in Europe.